With so many dramas going on-air at a time, bringing variation in the story of every serial is indeed a big task for the writers. The audience wants to watch something different but relatable. Mera Rab Waris on Geo Tv by the 7th sky Entertainment is a very unique storyline regarding a religious but vibrant girl Ayesha that has captivated the viewers. My Aishah! @harpalgeotv @danishtaimoor16 @asadaqureshi @7thskyentertainment @abdullah.kadwani . . . Thanks for all the love. 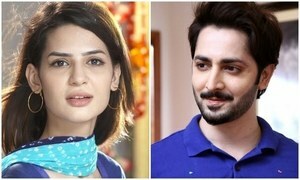 Mera Rab Waris revolves around the lives of two contradicting characters named Ayesha and Harris played by Madiha Imam and Danish Taimoor respectively who will somehow end up being together. In the last episode, Harris coincidentally saw Ayesha and her beauty had awe-struck Harris. The recent episode that on-aired on Thursday, accelerated the story. Harris who seems to be an obedient son of his mother was able to stand for his choice, his father who has given up in front of his wife seems happy at Harris’s decision and took a stance for him. While Harris’s mother and sisters have shown complete denial for Ayesha and have now developed a feeling of hatred for her too. Faizan on the other hand cannot bear Harris getting close to Ayesha. His frustration seeing Ayesha happy for Harris is very prominent on his face revealing his feelings for her. Ayesha and Harris finally had a conversation in the fifth episode and that scene is the highlight of the drama till date. This new on-screen couple shares beautiful on-screen chemistry that is thoroughly enjoyed by the viewers. Danish’s dialogues throughout the serial were exceptionally portraying the writing brilliance of Jahanzeb Qamar. The writing in sync with his expressions was undoubtedly a treat to watch. Madiha Imam was perfectionist with her naïve looks and brilliant dialogue delivery, while Mirza Zain Baig the beau of Ayesha had on-point expressions too. The recent episode has brought many twists in the story. To see how it will unfold further, tune to Geo Entertainment every Thursday at 8 pm.